As just a regular lay person with the only connection being a daughter in SPED, I learned so much! I much appreciate that I feel more equipped to share with others now. Thank you! The first group event for Advocate & Educate, LLC, fast approaches: The NYIT-AState Vollman & Wilson lecture, “Music and Medicine: Rhythmic Healing”. IT’S FREE on March 26, 2019 at Riceland Hall in the Fowler Center at A-State. The lecture features two premiere experts on the topic of the healing power of music. Click here for time/place details. This lecture is not only for doctors–parents and teachers can gain a lot out of the presentation, too. So tell your friends about this, and be sure to wear the Friends of FAPE name badge. Our group will meet in the Fowler Center outer lobby, to the left of the front door, before 6:20 p.m. YOUR REWARD: After the lecture, your name badge can be redeemed by you or another person for a free 1-hour consultation with Advocate & Educate, LLC. The consultation can be on anything related to IDEA or Sec. 504, either a personal question or you can just spend an hour sharing your great new ideas for educating special needs children. You can also share your badge, it is 1-time transferable. Just write the other person’s name on the back and give it to him or her. It’s totally up to you! 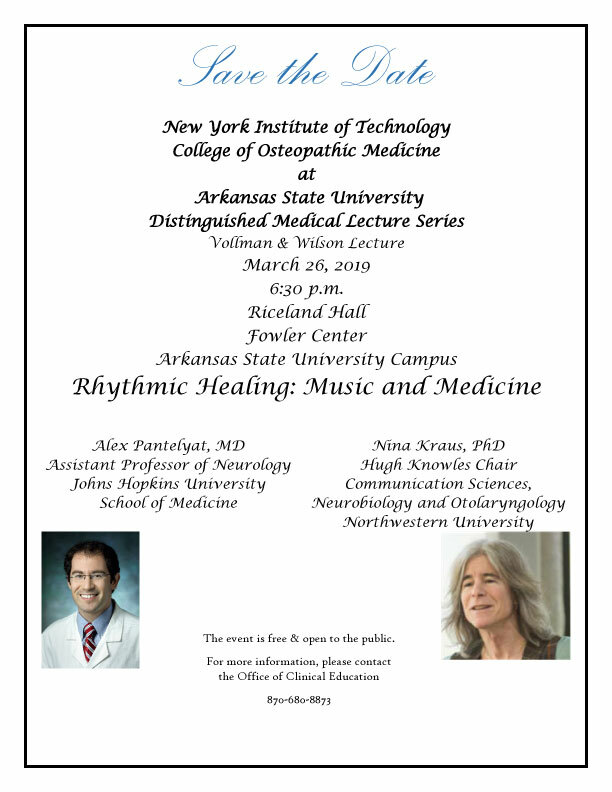 NYITCOM at A-State to host ‘Rhythmic Healing: Music & Medicine’ distinguished medical lecture on March 26. Program will feature neuroscientists Dr. Alex Pantelyat of Johns Hopkins University and Dr. Nina Kraus of Northwestern University. Actually, there is a strong chance that your intuition about your child is correct. Schools measure student progress against a standard scale, which can be quite different than your own child’s capacity to learn. 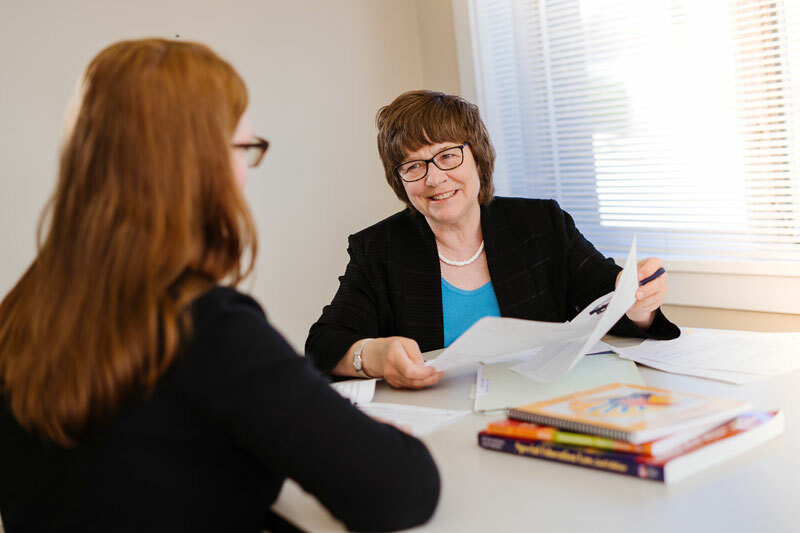 Learn how to measure student progress, where your child’s capacity to achieve becomes the appropriate and accepted standard, at our upcoming mini-seminar series, “Pro Secrets: Empower Your Advocacy”. Cost is only $10 for each session—attend one or all three—to cover basic costs. Coffee and Recovery Room bakery items included, so think of it as a nice Saturday breakfast, out, with benefits! 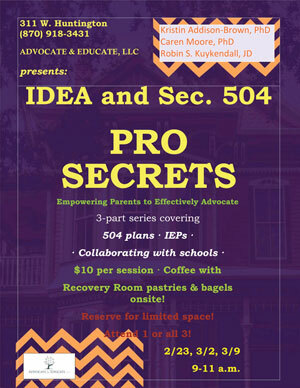 Be sure to call (870) 918-3431 or e-mail robin@kuykendalladvocates.com to reserve your space. Do you get to a school meeting about your special needs child, only to discover everyone else using terms you do not understand? Or, do you ever feel like the real meeting happened before you arrived? Maybe the paperwork bores and confuses you and then you miss school deadlines. Does it seem as if your child’s square peg gets forced into a round hole? Well, you aren’t the only one. We get it. We also know that you can learn to read the signs and understand instructional and related service opportunities available to every special needs child. We can help older children learn how to advocate for themselves, in many instances. With the experience and expertise of Advocate & Educate, LLC, as your child grows, your advocacy skills can grow, too. You can join our Advocate’s Circle today for the benefits of how we can help you handle school problems with confidence, avoiding lifetimes of frustration and unmet needs! Our comfortable facilities and developing, web-based learning opportunities for members make learning a time-saving, productive experience for you. Call, text, or e-mail Advocate & Educate, LLC, today for your free 15-minute initial consultation appointment.